« Boun Lod Continues to do Well. More Surgery Scheduled for November 2013. After a year at home in Laos, Boun Lod and Noi returned to the USA at the end of October 2013. (Many thanks to the Al Azhar Shrine (Calgary) Hospital Patient Transportation Fund for covering their transportation costs!) 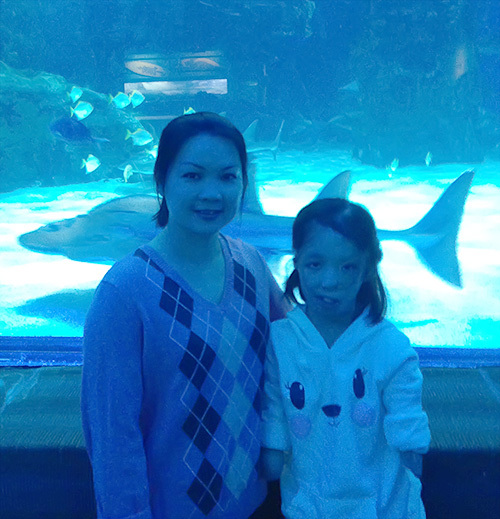 Noi and Boun Lod spent the first week with family in Philadelphia before continuing on to Cincinnati. The last thing Boun Lod had done before she went home in 2012 was to have the skin on one side of her scalp stretched, then cut, and her hair moved forward. Boun Lod’s first surgery for this round, in mid November 2013, was to have the same procedure done on the other side of her scalp. An expander was implanted and then gradually filled with saline. After about eight weeks, the expander was removed and the hair moved. Boun Lod has also received a new set of prosthetic arms. Donna, Boun Lod’s Care Coordinator in Cincinnati, arranged for Boun Lod to visit the Shriners hospital in Lexington, Kentucky to have the prosthetics measured and made. Apparently Boun Lod is quite proud of her new arms. When she first received them, Boun Lod went around the Cincinnati hospital to show them off to everyone. To get used to the new arms, Boun Lod is using them every day. These prosthetic arms are mainly cosmetic, but Boun Lod can still use them to a certain extent. Donna says it’s amazing what Boun Lod can actually do with them. The hospital is waiting to see how Boun Lod does with these arms before moving on to another more functional set. Both Boun Lod and Noi’s English is really improving. While they were home for the year, they both continued their English classes at Vientiane College and, of course, they’re immersed in English everyday in Cincinnati. Now that she’s back in Cincinnati, Boun Lod studies English and math at the hospital’s school for two hours a day during the week. The teachers figure Boun Lod’s English is at about a grade four level. When we last talked to her, Boun Lod said she had just finished reading a book about Helen Keller. When Boun Lod is not in school, she is doing her homework, playing with the other kids in the playroom, or enjoying various types of board and video games. This year, Boun Lod and Noi are living in family accommodations right inside the hospital. There is a kitchen, and Noi is able to cook. Noi says this arrangement is working out very well. Volunteers from the local community have been very good to Boun Lod and Noi. They’ve taken Boun Lod and Noi on outings to places like the zoo, and they’ve taken Noi to the Asian market so she can purchase the ingredients she needs to make Lao food. Boun Lod’s next surgery is scheduled for early April, and will probably be on her mouth. Once she has healed from that procedure, the doctors are planning to do further surgery on her nose. It won’t come as any surprise to hear that it’s been a long, cold winter in Cincinnati. Like the rest of us, Boun Lod and Noi are looking forward to warmer weather, sunshine, and green grass! This entry was posted on March 11, 2014 at 11:32 am and is filed under Uncategorized. You can follow any responses to this entry through the RSS 2.0 feed. You can leave a response, or trackback from your own site.